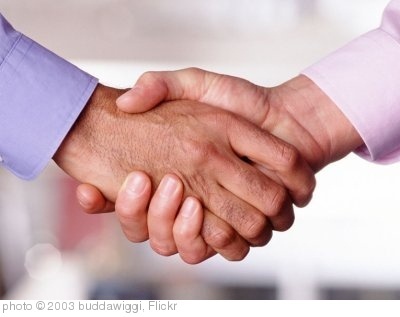 Sales are built on trust and relationships. If we believe something does what we want and the price is right, we’ll buy it. On the other hand, if we don’t think the ingredients are safe or we just don’t believe it’s going to work, we won’t buy. And if we don’t like or trust the person selling it or representing it in a commercial, we almost certainly won’t buy. Trust is big. To address this reality, companies often rely on trusted celebrities or word of mouth to increase sales. If we hear someone we trust say they like a product, we transfer our trust from that person to the product. A big company might be lying just to increase sales. But would Mom? The guy next door who knows cars inside out? Beyonce? No way they’d lie. We believe them, and we therefore believe in the products they recommend. That’s where blogging and social media can come into play. As marketers we have the opportunity to establish trust in the community by conversing with our customers and getting to be known so that, over time, those customers will trust and like us. Next, as they hopefully become loyal customers, they will share their love of us with their wider networks. The trust in those relationships is then transferred to us and our products. It’s the same way people have shared news for generations about a dentist we trust or car we drive or blacksmith we rely on or church we find comfort in. The technology has changed, but the process has remained strikingly similar. 1. Establish trust with your own blog. If we all tend to favor people and suppliers we know and trust, then it makes perfect sense for companies to work very hard at being known and trusted. Few activities can do this as well as blogging. You get a chance to showcase your knowledge, explain your vision and policies, establish your character, set your standards, and build common ground for an ongoing relationship. A key to doing this well is to set up an editorial calendar, so that you schedule and track the most strategic topics for your blog. Becoming recognized as a credible authority in your industry can give you a tremendous sales advantage. 2. Network with other bloggers. You can bring in readers for your blog by interacting with other bloggers who have similar interests. Put some real thought into offering meaningful comments on their posts. Learn from the bloggers who are doing things well. Ask for their feedback. And look for ways you can be of real value in return. After you’ve built some mutual respect and comfort with each other’s style, suggest guest blogging. If you’re trying to build relationships, it makes sense to start by building some key ones. 3. Support your blog posts through social media. 4. Don’t be a spammer! Yes, social media can be a great way to support your blog. But — and this is one very big “but” — don’t spam. If you’re promoting yourself in more than about one in every five tweets or posts, chances are good some people will see you as a spammer. So don’t sell. Relate. Answer questions. Recommend solutions that don’t always benefit you. If you’re on StumbleUpon or Reddit or a similar site, make sure you post at least as many great links to other sites as you do to your own. Listen to what people are saying. Look for ways to just be friendly. Show you have a heart and a sense of humor. Learn what really interests people, not to pull them in so you can make a sales pitch, but just to know them better. 5. Be there to give rather than just get value. By all means, use social media to support your blog posts. But it’s just as important to support others as well. So, similar to the advice above for networking with other bloggers, look for ways in social media that you can help others. Intangible factors affect how we feel each time we meet a new person or company, whether in real life or online. It often comes down to a “gut feeling” we have about someone. They either click with us or they don’t, and that sixth sense can have a huge impact on whether or not we choose to trust and do business with them. And many times, that first impression is based on whether a new contact strikes us as a giver or a taker. Be a giver. There are of course countless ways to do any one of these. You’ll likely find the biggest challenge is often not how to do it, but how to simply find the time to do it. Work hard to make your social media and marketing time a priority; it may prove to be the most valuable few hours you’ll spend each week. And as you set up your blog post and get more active in social media, make it a point to always let your unique personality and style shine through. Be a real person with a real personality. It makes good business sense, and it’s a whole lot more fun than always pushing a product. @LawrenceBerezin Thanks very much for the comment, Larry. There are many people I see regularly who are very giving, and of course always a few who don’t seem to have caught on to the “giving” notion at all yet. Those who do give though definitely brighten up the place, and usually have no shortage of followers or friends. In that way, social media is a lot like real life. How about you? What are you seeing out there? “In 2009 we knew the Internet held a lot of potential for us, but we didn’t know how to get started. We contacted Lorne and were impressed with his understanding of how to move us forward. His social media and SEO work started generating positive results almost immediately.